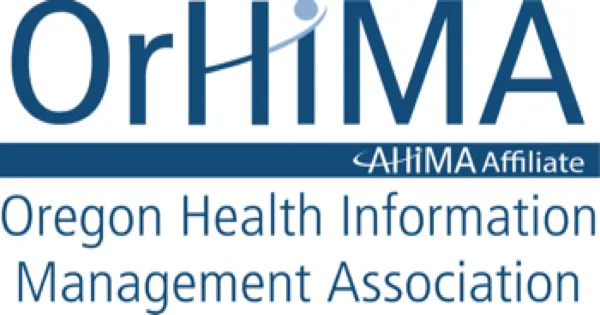 We are the Oregon Health Information Management Association and our website address is orhima.org. Oregon Health Information Management Association is a nonprofit membership association whose mission is to support American healthcare professionals by providing products and services including, but not limited to, informational and educational, in-person and online meetings and training. All OrHIMA employees and members are based in the US and OrHIMA has no affiliates based outside the US. OrHIMA products and services are available only in English and may not be available in all regions; payment for goods and services is accepted only in US dollars. Choosing to purchase or use products or services provided by OrHIMA signifies that you understand and agree to this privacy statement and accept the methods for storing, using, and sharing your information. OrHIMA’s Data Privacy Statement affirms OrHIMA’s commitment to honoring the privacy of anyone who provides personal information on our website through careful compliance with privacy and data protection laws. It is OrHIMA’s goal to constantly improve its services to meet its customers’ needs. There are times when OrHIMA collects and stores information, including personal information, which enables us to provide quality services, such as member services, product and sales information, and information about the health profession. OrHIMA website users are cautioned it is their responsibility to check our data privacy statement frequently for updates that may affect them. This statement applies to all products and services offered by OrHIMA and covers all personal information collected from OrHIMA’s website. It does not apply to services and products offered by other entities or persons, including other companies and organizations that advertise OrHIMA services or any third party operating a website that is reached by a link from an OrHIMA website or other digital assets (such as electronic forms). OrHIMA uses some social media tools and websites to interact with its customers and resource partners. Websites and email communications are used to publicize OrHIMA programs and services and engage with members of the public. The OrHIMA privacy and other web policies do not apply to these third-party sites and we encourage you to read the policies of the third-party site when deciding whether to use it. OrHIMA is committed to using current, appropriate technologies, contracts, administrative, physical, and organizational measures to protect your personal information from data loss, destruction, unauthorized access, and accidental and/or unlawful disclosure or manipulation. These measures are subject to continuous improvement actions as technologies progress. Credit card information submitted via the OrHIMA website is not retained in any form by OrHIMA. Credit card information is processed and maintained by third party vendors. OrHIMA does not market to children and does not knowingly collect personally identifiable information from children on the OrHIMA website. OrHIMA may use personal information collected through its online services and other methods (such as e-mail, fax, chat, telephone) to provide you with information, products, and services you may be interested in, request, or purchase; to contact you with member information; to invite you to participate in surveys and research projects; to invite you to provide feedback; to better understand your needs or interests; or to improve our products and services. Additionally, basic personal information, as identified above, may be exchanged with OrHIMA third-party business partners that aid in the delivery of purchased services. OrHIMA may also share your information in the aggregate with governments, regulatory bodies, and/or supervisory authorities, and as required by law. OrHIMA uses the data collected to provide and improve goods and services to users. Registrant contact information may be made available to other participants. This may include the compilation of such information in both hard and soft copy which may be made available to participants and, in limited circumstances, to others. OrHIMA members, customers, subscribers and event registrants will receive electronic and printed communications, including, where applicable, regular publications and information regarding OrHIMA member and other events, elections, and other information related to the provision of member and customer services. If your photo is provided to OrHIMA then your image is publicly accessible. The OrHIMA website provides interactive forms that let you voluntarily submit personal information (to include but not limited to your name, address, e-mail address, phone number, company name, and job title). In these cases, all submitted information is used only for the express purposes for which it is provided. We use persistent cookies to enable Google Analytics to differentiate between new and returning OrHIMA visitors. Persistent cookies remain on your computer between visits to OrHIMA website until they expire. We also use persistent cookies to block repeated invitations to take the customer satisfaction survey. OrHIMA may utilize third party services to enhance its distribution of data and information (e.g., videos) through links from the OrHIMA website. A persistent cookie may be set by such a third-party provider when you click on the provider’s link in order to access the OrHIMA data (e.g., play a video). By default, persistent cookies and web measurement technologies are automatically used when you visit the website of OrHIMA. Nevertheless, if you decide to disable or remove cookies from your browser, you will continue to have access to all information and resources on the website of OrHIMA. In addition, OrHIMA may provide member information to local affiliated associations or national affiliated associations for standard business. OrHIMA may retain your personal information in its systems for the duration of required business operations. Your information will be retained as required by law. OrHIMA is not responsible for, and expressly disclaims all liability for, damages of any kind arising out of use, reference to, or reliance on any information contained within the site. As a condition of use of OrHIMA’s website, the user agrees to indemnify and hold harmless OrHIMA, its officers, employees and agents against any and all liability, expenses (including attorney’s fees) and damages arising out of claims resulting from user’s use of this website.